The HFS Architecture diagram illustrates how HFS-related components interact and communicate with one another. Historical Fill Server: Records fills and writes them to the database. 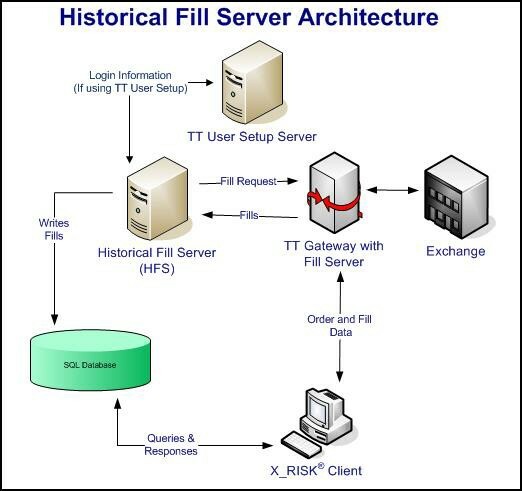 TT Gateway (with Fill Server): Sends fills to the HFS upon request. SQL Database: Stores fill data. X_RISK®: Requests the display of historical fill data. TT User Setup Server: Used to configure user logins, including the HFS logins (optional). Note: If the Historical Fill Server goes down (even during trading hours), any missed fills are downloaded from the Fill Server when it’s restarted. TT does not support HFS data replication.